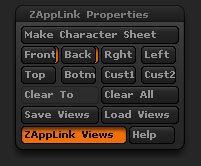 The ZAppLink Properties sub-palette provides buttons for different views of your model for use with the ZAppLink plugin. Create a character sheet .PSD document using the current model and the views set using the view buttons below. Press the Front button to store the view of your model that corresponds to the front view. The Back view will be automatically stored. Press the Rght (Right) button to store the view of your model that corresponds to the righthand view. The Left view will be automatically stored. Press the Top button to store the view of your model that corresponds to the front view. The Botm (Bottom) view will be automatically stored. Press the Cust1 and Cust2 buttons to store custom views of your model. Press this button and then press the view button that you wish to clear. Press this button to clear all views. Press this button to save the current view set as a .VWS file. Load a previously saved .VWS file from disk. When this switch is turned on and the main ZAppLink button is pressed, a multi-view model edit will be sent to Photoshop. Press to read the ZAppLink documentation PDF file.